This boutique development in Devonshire Lane is set amidst historic buildings in the heart of the city. The spacious apartment boasts a beautiful kitchen and bathroom, air conditioning, off-street parking in gated development and a study or guest room (2nd bed). Surrounded by cafes, shops and with easy public transport options. Walk to shopping centre, cafes, beaches or Newcastle Foreshore. * Spacious 4 year old one bed apartment with study/2nd bed. * Discreetly located in heart of city amidst historic buildings. * Surrounded by cafes, shops and easy transport options. * An ideal home or investment with easy light rail access. 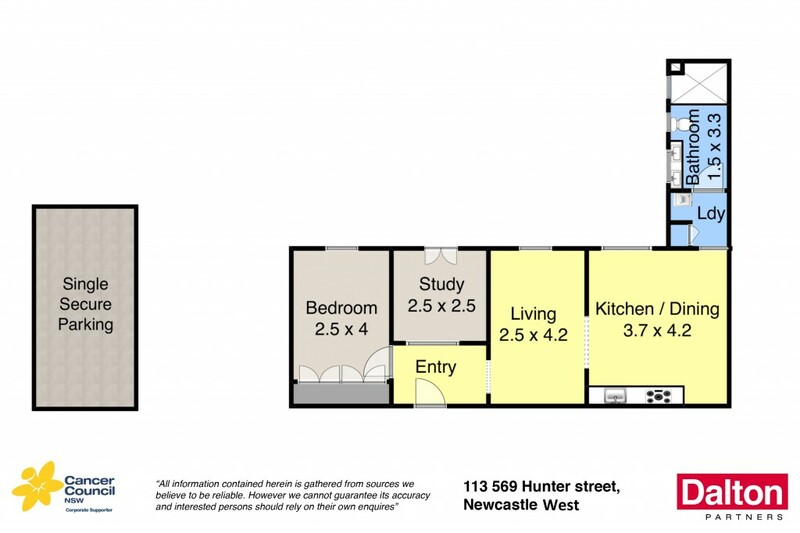 * Walk to Newcastle Foreshore, beaches and inner-city amenities. * Stunning kitchen and bathroom plus internal laundry. Water Rates: $588 +Usage PA approx. Strata Levies: $614 PQ approx. Rental Potential: $430 - $450 PW approx.